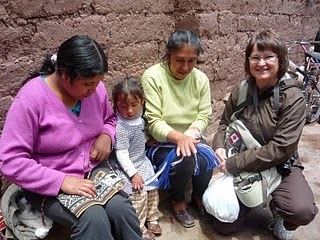 Who would have thought that a group of Manitobans doing missionary work in Peru would end up buying souvenirs in a mini workshop producing goods from llama or sheep's wool on weaving looms that are there because of the intervention of a young man from Manitoba? However that is exactly what happened last Thursday March 3rd some 7,000 km from Winnipeg. 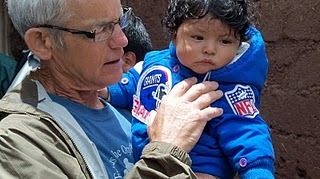 Thanks to Norbert Ritchot's superb organizing skills it was possible for part of the RRMRR group (16 persons) to visit a poor suburb of Cusco, Peru. We had the opportunity to visit the site from which the products sold by Étchiboy, a Manitoba company owned by Miguel Vielfaure from La Broquerie, is located. Since 2006 Étchiboy imports sashes (ceintures fléchées) and other products hand made by a group of ladies coordinated by Santos Cutipa Suclle from Cusco, Peru. 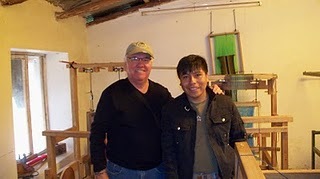 Thanks to Miguel's support by financing the looms (Santos built them himself) and because Étchiboy buys all the products from the group, 20 families have found well renumerated work. What had led us to seek out this workshop was the fact that we knew that most of the workers were widows or single mothers and we wanted to support them by buying some of our souvenirs from them. We were not disappointed. Upon our arrival we were greeted by the ladies who were there at that time as well as by their children (because of their particular family situations the ladies bring their children to work). Upon our arrival the ladies were sitting on a step to do their work. After the greetings we were invited to visit the workshop which is actually a small room where the seven looms are located. When I asked Santos if one of the unfinished pieces in one of the looms was for Miguel he answered "Todos para Miguel" ' (it's all for Miguel)? What a nice experience for our group and what a testimonial to Miguel, a young Franco-Manitoban who opted to get involved and "make a difference". And what a difference it makes for these ladies at the other end of the world. Étchiboy is a Métis company which creates high quality aboriginal products. 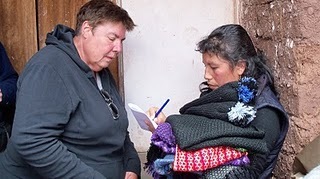 When you buy one of our products you are also supporting single mothers and orphans who are Quechua Indians from the Andes in the region around Cusco, Peru. Copyright © 2019 Etchiboy Métis sash experts. 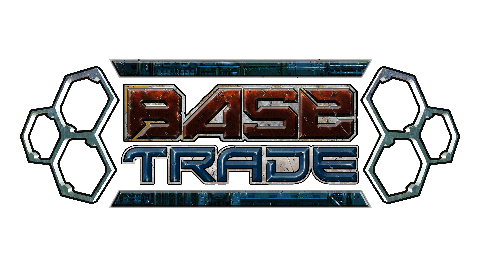 Designed by	Klasik Themes.